At Strong Roots Dental PC, we use composite fillings as a treatment method for tooth decay. If you live in Hoboken, NJ or surrounding area and are looking for a natural-looking restoration, we encourage you to call (201) 234-4070 and schedule an appointment. Our team has the necessary experience with placing these tooth-colored fillings and can work to ensure that the patient is comfortable throughout the procedure. This is one of our most frequently used procedures, since a filling is typically placed after removing tooth decay (common cavities). If you have amalgam fillings now, we can even replace them with composite ones. To learn more, call and schedule a dental examination. We can place a composite resin filling fairly quickly. This is an affordable and durable restoration that will look similar to a regular tooth. We make sure to complete the procedure in a way that is comfortable, effective, and fast. In some situations, depending on the patient and the position of where the filling will go, we can complete a filling every 30 minutes. If you live in the Hoboken area, we encourage you to consider the many benefits of getting tooth-colored fillings instead of amalgam ones. Tooth-colored fillings are safer for your health since they consist of resin or a plastic material. Silver fillings are typically not silver, but a metal alloy that includes several materials with mercury among them. There have been numerous health warnings regarding the overexposure to mercury, which is why pregnant women are warned to stay away from tuna. While many people believe amalgam fillings are perfectly safe, the data can be contradictory from study to study. If you want to avoid the risks that come with mercury exposure, select tooth-colored fillings, or replace your existing silver fillings. Visit our Hoboken, NJ dental office for more information. Q. What is a composite resin (white filling)? A. Resin fillings match the shade of your natural teeth while providing the necessary level of protection. While many refer to a composite resin as a "white" filling, the actual shade may be more of a crème, if that is what is necessary to blend in. Composite resin fillings function in the same way amalgam ones do, so they are still effective for restoring teeth that have suffered from decay or fracture. However, they can blend in and become more discreet for other patients. Q. 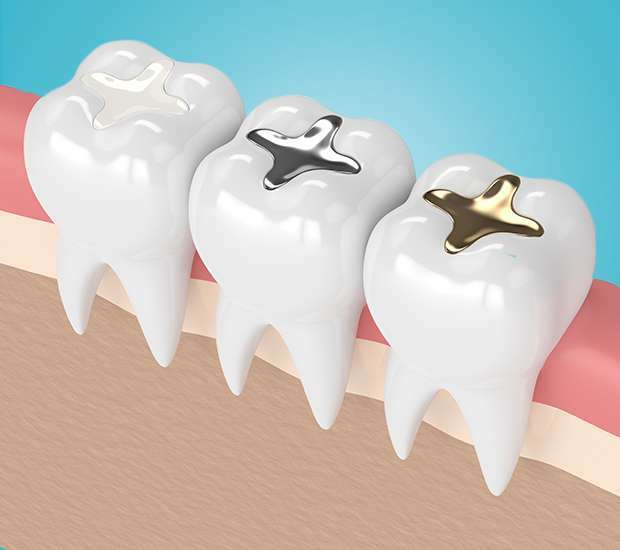 What are the advantages of composite vs. amalgam fillings? A. The biggest advantages of composite vs. amalgam fillings is that composite tooth-colored fillings do not stand out. If you have a cavity and need a filling, you can select a restoration that stands out when you smile or one that blends in. Patients do not have to worry about other people noticing the tooth-colored fillings. Another advantage is not having any mercury in the filling and decreasing the risk of other health risks. To learn more about this option, call 201-234-4070 and schedule an appointment with our Hoboken, NJ dental office. Q. How are composite fillings used? A. In our dental office, we use composite fillings to restore tooth structure after removing the pieces of tooth that have decay. In other cases, we will use composite fillings to restore tooth damage. For example, if a tooth is chipped or loses some of the enamel, a filling may be the appropriate restoration. Q. Can anyone get a filling? A. No. At Strong Roots Dental PC, we place fillings on a frequent basis, but in order for this type of restoration to work, you need to have a certain amount of healthy tooth structure remaining. If you are missing too much of the tooth's structure, a dental crown may be the better solution. In this case, a crown surrounds the tooth like a cap, providing a stronger and more protective restoration. Q. What is the difference between tooth-colored or composite dental fillings? A. Composite dental fillings are just one type of tooth-colored fillings available. While professionals can use the alternate types of tooth-colored fillings interchangeably, there is more than one way to receive a tooth-colored filling. Natural-looking fillings typically consist of resin, ceramic, plastic, or glass ionomer; the most common material being composite resin. While all materials are effective, glass ionomer lasts the least amount of time since the material is more fragile. Q. How long do resin fillings last? A. There is no set expiration date, but we warn patients that fillings can deteriorate and wear down just like normal teeth. This makes it important to practice good oral hygiene and to brush with a soft or electronic toothbrush while avoiding biting down on anything inedible like a pencil. Q. Are there any special care instructions for cosmetic fillings? A. No, you need to care for your fillings just like you do your other teeth. You need to brush at least twice a day and floss on a daily basis. We recommend using fluoride toothpaste, since this can help to further strengthen your teeth and prevent further decay. In some cases, we may even recommend a fluoride treatment in our dental office. You should also be careful to avoid doing anything that could damage your teeth and wear a mouthguard if applicable. Keep in mind that a filling is there to restore your tooth structure both in appearance and in functionality. This means we are not trying to restrict your activities or even what you can eat. Instead, we place fillings to ensure your life is not interrupted and you can return to your normal daily activities quickly. Q. When can I eat like normal? A. If you need to have a filling placed, we will first need to remove the decayed portion of your tooth and complete a thorough cleaning. Next, we will place the composite resin filling material on your tooth and shape it before the hardening. The shape needs to be just right so your bite will fit together correctly. It can take a couple of days to get used to eating on the tooth. Thus, while it will not be particularly uncomfortable, you may have one day where you feel as though you are adjusting. For more specific information, call (201) 234-4070 to schedule an appointment. Q. What are the benefits of tooth-colored fillings? Q. What are composite fillings for? Q. Will the filling change what I can eat?